The Essential Health Resource for Anyone with Specific Health Concerns or just the Desire to Nurture and Maintain a Balanced, Healthy Body. "Dr. Yoga is a wonderful guide to both preventing the most common diseases and as an adjunct treatment to conventional medicine. It will be a great service to so many people." Dr. Dean Ornish, M.D. ; Bestselling author of "Reversing Heart Disease". 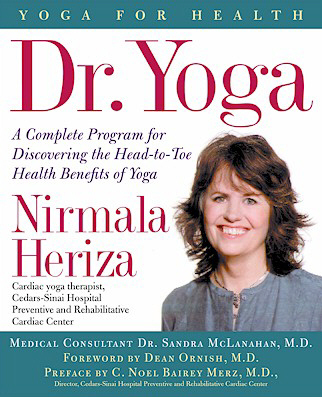 "Heriza's remarkable book helps reaffirm the role of yoga as a serious therapeutic modality." "Heriza offers a comprehensive scientifically documented program for preventing and treating disease, based on hatha yoga postures, relaxation techniques and diet." "I used the programs in Dr. Yoga to overcome two brain tumors and colon cancer. They saved my life." "While filming "Dragnet" I would do the 10 minute microsession that Nirmala recommended for my lungs and back and I would feel better. Really better". "The Integral Yoga based Dr. Yoga program is a gentle but deeply affecting yoga. I liked it instantly."